The contact system is a set of two ghost boxes ( modified radios) another radio or white noise generator, along with a amplified mic. All of which is ran into a mixer. 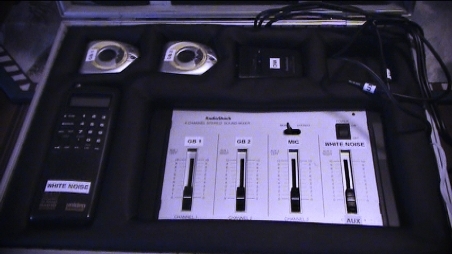 The mixer is then conected to a computer to record with. This system was designed by Ron. The equipment in the system can be changed as needed or desired for better results. ITC ( Intrumental Trans Communications ) has been experimented with under control methods as well for many year before present day. Collected here are the EVPs from the Contact System. These were collected live on 5-5-10 while viewers watched through our cams set up at my studio. No matter what you believe, the voices are real examine the facts for yourself.. The voices of EVP have been studied under scientific condtions back in 1950s to present day... Look up the name Raudive. In this EVP you will hear the word "Pakistan", it was the control word. Could this be a voice from a entity repeating words? Use headphones for best results. Here is the word "Pakistan" alone, from the clip to the left. Above you can here a voice say, "shut the door."